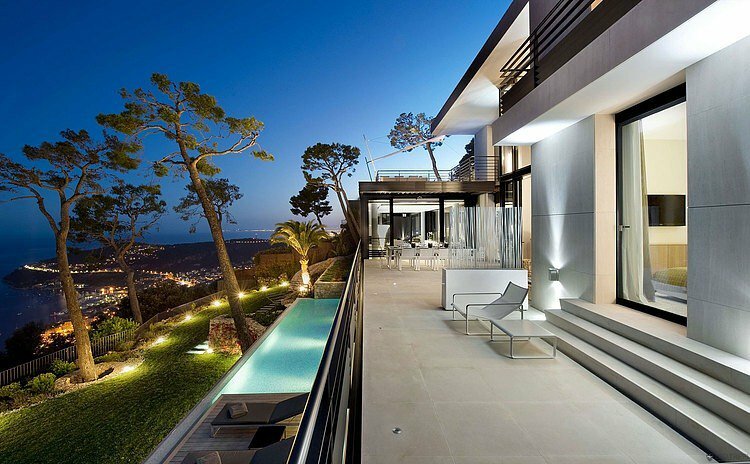 This luxurious contemporary three-storey villa is located just 15 minutes away from Monaco, in Villefranche sur Mer, Villa Baie – Côte d’Azur. The exteriors are set with extensive furnished terraces and a heated infinity pool facing the sea that extends with a lawned garden. On 3 levels distributed by a lift up to the solarium terrace, the interiors bathed with sunlight comprise, on the upper floor an entrance hall from the parking and garage, the master suite with dressing and bathroom, one double bedroom with bathroom and one double bedroom with shower, all opening onto the solarium terrace. Down, the main level opening onto terraces comprise a large living room, a dining room, a professional kitchen, a day toilet, a double bedroom with bathroom and a double bedroom with shower room. The pool level it set with a large furnished beach club and a service bedroom. Air-conditioning, sophisticated audio-video and security systems throughout; Parking with car turn table and garage; Luxury service level and personnel on demand; Rental all year long.